I'm not so big on New Years, in fact it's probably my least favorite holiday. To me it marks the end of the Christmas season, the most wonderful time of the year. All the beautiful lights and Christmas decorations get put away and it's back to the loooongggg, cold New England winter. No more lights and Christmas spirit to make all the white stuff on the ground seem fun. I know, boohoo, you can all get out your violins and play me a sad song. Anyway, no more Debbie Downer here. I'm putting on my big girl undies and looking at the bright side of things. I usually never make New Years resolutions, I think I'd rather not be let down at the end of the year when I don't accomplish the 101 things, including flying to the moon on my list. 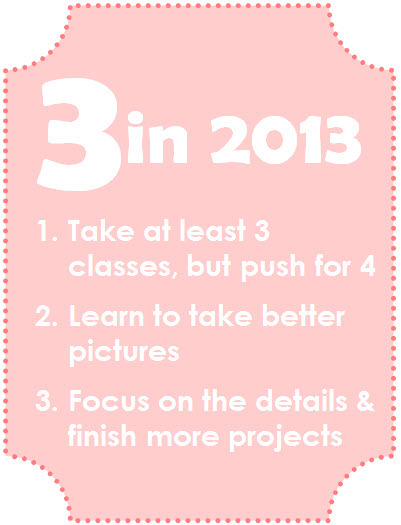 But this year I decided to keep it simple with 3 things I know I can accomplish. 2. I have a really great camera, with a brand new lens that I got for my birthday, I need to learn how to work the thing and take better photos for myself and this blog. 3. I've got all these grand ideas for projects and crafts- and then things like my full time job, school, homework, and life get in the way. This year I really want to make an effort to paint more, sew more, create more. If not for anyone else, but for me. Its a large stress relief and who doesn't need stress relief these days. I think putting this out there and making it public will be the motivation I need. I now get why other bloggers do this every year, it makes total sense. It was stressful to think about, but now that it's out there its like a big weight off my shoulders. I can't wait to check off those boxes... 2013 bring it on! You can do it! Auto CAD is a cinch. You'll be able to learn it in no time. It makes me sound like a dinosaur, but I've been using it since R14 (1997!) back in the days of Softdesk! Yay, you did it! You wrote a new year's post :) Can't wait to see what 2013 holds for you! I feel so fortunate to read your blog. Thank-you, you always share such great things, your accomplishments, your fun diy's and I never see the things you have unfinished. I wish you a sparkly winter....I keep my lights up for as long as I can. They motivate me and this year I am starting early for next holiday. I am. I like the number 3. This sounds challenging, but doable. I used to get lost in my sewing. I would work for hours. I miss getting totally lost in a project. Good luck!